WordPress 3.8 is available! Upgrade today for only $149 and be protected against the latest website threats. E-mail us to upgrade. WordPress is consistently upgrading their system in order to provide a better user experience, a better developer experience and more effective security measures to protect against threats to your website. It’s always good to speak with one of us at JM to find out the benefits of the latest WordPress version, but WordPress 3.8, also known as “Parker,” is worthy of looking into. We encourage you to watch the video on the WordPress site to get the full effect. There are a couple things we love about this new version of WordPress. 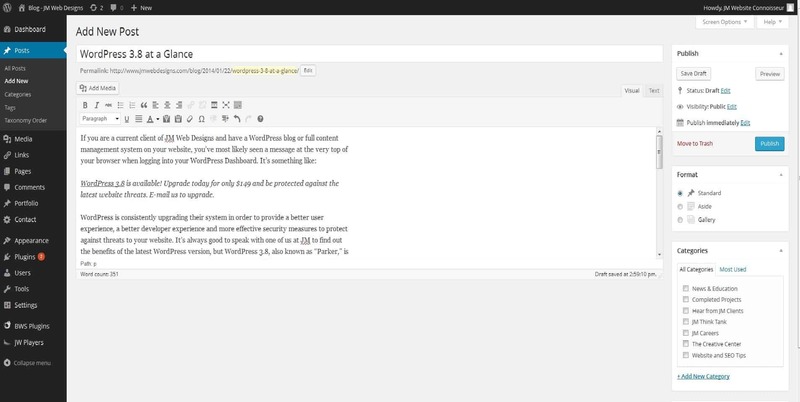 First, it’s by far the most aesthetically pleasing version of WordPress we’ve seen. From the admin perspective, the new dashboard has modern typography, a clean layout and the ability to customize your colors. As web designers we certainly appreciate this fresh new look. The other aspect of WordPress 3.8 that we love is its responsive feature. If you have previously attempted to update your website through the WordPress admin on tablet or mobile devices you will know it was no easy feat! Now – with this latest version – the dashboard will respond to your browser size to allow for a clean and easy way to update your website on any device. Our design team can also help you create a more user friendly experience for your visitors on the front end of your website through responsive design. Our Omaha web design team would love to speak with you about WordPress 3.8 and are, of course, always willing to help you assess any new version of WordPress as it’s released. Be sure to take a look at version 3.8 to get idea of how it will help your Omaha business be more effective, efficient and safer with website updates. If you haven’t already, we suggest you pick up the January edition of the Midland Business Journal. JM’s founder and CEO, Jonathan Patton, is featured in an article regarding Omaha business websites and the importance of design, content and overall functionality. We’d encourage you to read to the article, but to give a brief overview, Patton and other web design professionals in the Omaha area comment primarily on professional and functional website design, and the benefits of content management systems for business websites. Guidance from a professional Omaha web design company will help businesses organize and manage their content, while accurately reflecting a company culture and atmosphere in the design. We appreciate the opportunity to be featured in the Midlands Business Journal, and hope you have the opportunity to pick it up. Recently, Omaha has been featured in national media – CNN, Fox New, Info Wars and other media outlets – for a posting made on the Omaha Police Officers Association (OPOA) website. JM worked with OPOA to design and build its website, and ever since we’ve watched their user base and impact in the community grow. The particular post receiving recent publicity is difficult to watch and contains disturbing content. But this post is one of several that go out weekly from the OPOA educating the community and police force about local, Omaha criminals, avenues for help and laws that impact Omaha citizens. 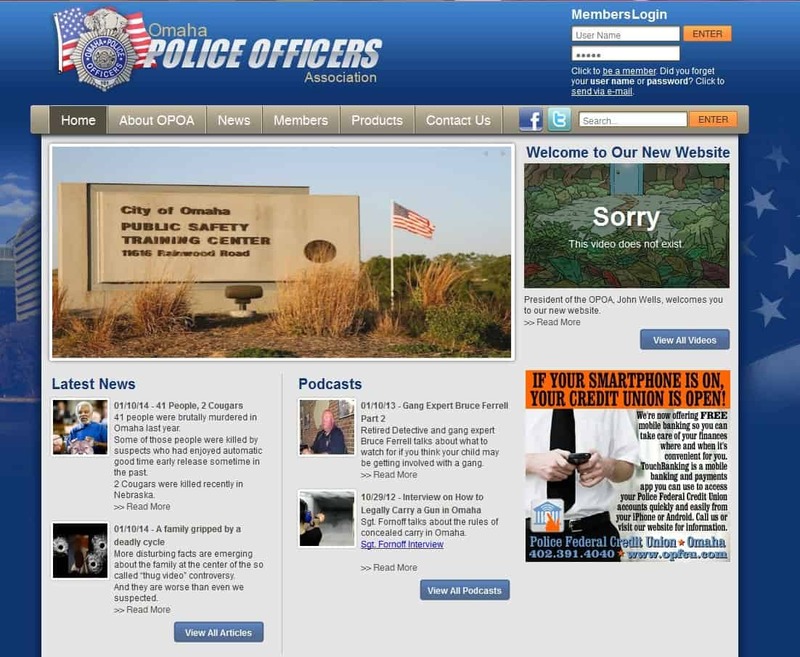 Using a robust WordPress content management system, OPOA posts news articles, podcasts and videos for the purpose of educating and informing the Omaha community. JM also serves OPOA’s web hosting needs. Our reliable web hosting has supported over 150,000 website visitors within a 24 hour period. It’s encouraging to see our clients utilize the powerful online tools we give them. A website can allow businesses and organizations to be a formative part of a community, an influential source of knowledge and a resource for anyone in need of a service. JM’s long-time client, Omaha Track, recently decided to undergo some cosmetic and functionality changes on their websites. Omaha Track has several divisions in their company, serving many aspects of the railroad industry since 1983. Years ago, our Omaha web design team built a few different websites for their company’s divisions, but as they’ve grown and changed, a redesign became necessary.